Just 5 minutes drive from Nadi International Airport is the Capricorn International Hotel. Perfect for a stop over before heading out to an island or on your way back home. This Fiji accommodation features a resort style pool, bar & restaurant and provides guests access to the Nadi Sports Club which includes tennis & squash courts. Be pampered with a massage in the Day Spa, play a round of golf at the nearby Nadi Golf Club or just relax by the pool with a tropical cocktail. Club Fiji Resort is only a short distance from Nadi International Airport. The resort is set on 12 acres of lush tropical gardens and 500 metres of sandy beaches. Just 4 kilometres from Nadi Town centre this friendly resort offers value for money accommodation without having to travel a long distance. 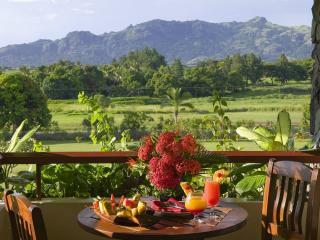 This Nadi accommodation is ideal for couples or families for a holiday or relaxing break. Fiji Gateway Hotel offers the perfect location for those arriving into Nadi on a late night flight or departure early in the morning as it is only a short walk from the Nadi International Airport. This Fiji accommodation boasts a wide variety of facilities including 2 swimming pools with a waterslide, a poolside bar, tennis court, restaurant, and wireless internet access. There is also a complimentary airport shuttle. The Grand West Villas is ideally located at Wailoaloa Beach, Nadi Bay and is comfortable for a short stopover when arranging your next Fiji holiday. The expansive grounds at Grand West Villas include a lagoon style swimming pool with water slide, tennis courts, restaurant and cocktail bar. 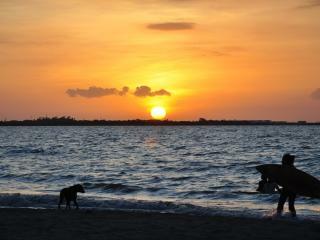 The Nadi Airport Golf Course and Nadi Bay Beach is only a short stroll from the Grand West Villas. Conveniently located only five minutes from Nadi Airport and ten minutes from Nadi Town, the Mercure Nadi is a handy base for travellers exploring Nadi and the offshore Fijian islands, with easy access to many restaurants, bars and nightclubs. Most rooms overlook the swimming pool and garden and the hotel features the Rokete Restaurant, with alfresco dining on the poolside deck. Novotel Nadi is set on 42 acres of tropical gardens and just a short drive from the Nadi International Airport, furthermore only a 10 minute drive to Fiji's business district. 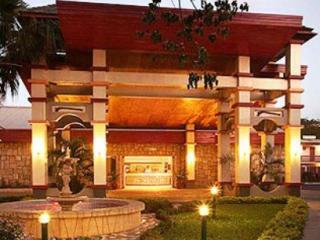 This affordable resort offers a range of recreational facilities, restaurant and bars. Novotel Nadi offers complimentary transfers to and from Nadi International Airport for all guests. 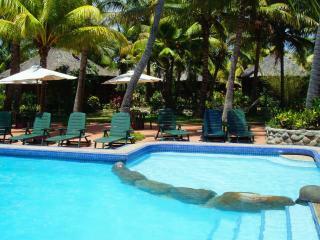 Smugglers Cove Beach Resort & Hotel offers direct beach access to the Nadi Bay area. This Fiji accommodation is located just 10 minutes from Nadi International Airport, making it ideal for those with a short time available in Fiji. The resort has a wide range of accommodation choices, with many rooms featuring ocean views. Smugglers Cove has facilities including a swimming pool, bar and near by golf course. 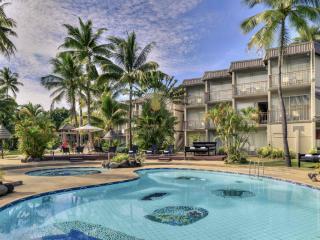 Tanoa International Hotel is Nadi's largest airport property comprising of 148 rooms and suites with private facilities. 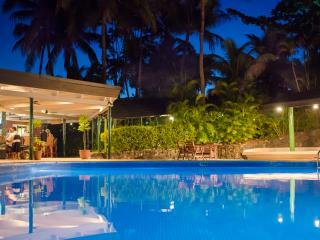 The resort is situated on 15 acres of lush tropical gardens and conveniently located 3 minutes from Nadi Airport. Tanoa International facilities include swimming pool, tennis courts, restaurants and bars and offers guests complimentary airport shuttle service. The Tokatoka Resort Hotel is located directly opposite Nadi International Airport and is a convenient, great value airport property catering for couples, families and business travelers. Relax in the swimming pool with a drink from the swim up pool bar or work on your fitness in the swimming lanes. Perfect place to begin or finish a Fijian holiday.